Hello!! Happy weekend to all my readers! Hope you are well! 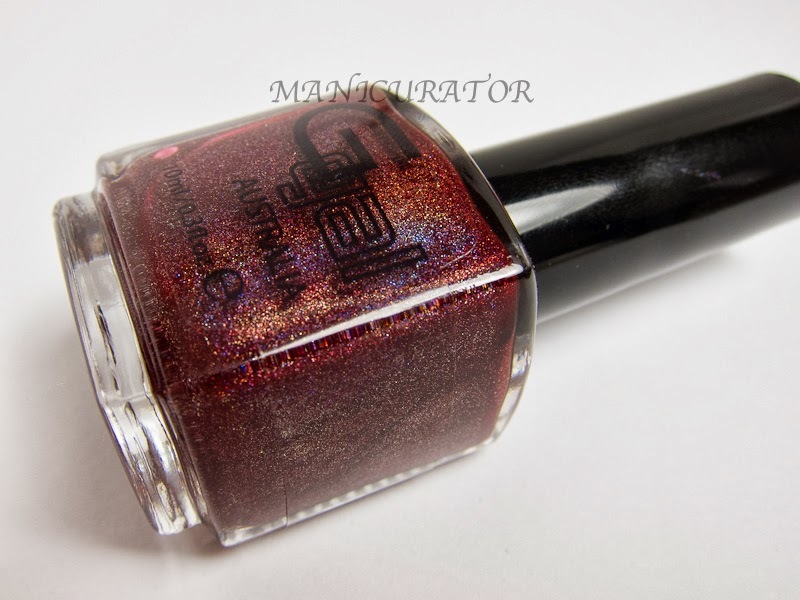 I'm showing you two perfectly Fall appropriate shades from Glitter Gal today. Check out their facebook page to see the latest. If you haven't heard of them yet (though I'm sure you have) they create world renown linear holo glitter shades, and a host of other special finishes like the duochrome I'll also be showing you. The application for Hot Chilli, for me was somewhat challenging. The first coat went on...sort of like it has oil in it. It didn't spread smoothly and sort of slimed over some spots. I did apply it over base coat, (KBShimmer Basic Training) and I have a feeling application would have been better over a different base or non at all. As you can see, the final look doesn't AT ALL show that I had difficulty applying. I have on two coats, with the second coat thicker and with a light hand so as not to spread it out and cause bald slicks. It dries to a somewhat satin finish, a cross between glossy and matte. I applied Seche Vite top coat (starting with the thumb) and immediately I saw the holo finish disappear, so I stopped and took photos without top coat. The last photo shows the whole hand with top coat, you can see how it is still a gorgeous polish, but the top coat changes it's appearance. Glitter Gal Buckled Bronze is shown here, one coat over two coats Milani Black Swift. Buckled Bronze's duochrome effect is very subtle, I was not able to capture it very well. It has a reddened bronze base with a slight color shift to lighter brown and olive. I haven't tried any Glitter Gal polish yet but your swatches have convinced me I need to! The two polishes are gorgeous!